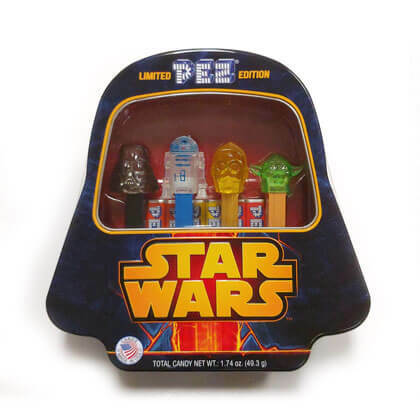 This collectors gift tin features Darth Vaders head with 4 crystal Star Wars pez - Darth Vader, R2D2, C3PO and Yoda B. Limited edition. 6 refill packs. Total candy weight is 1.74 oz. Approx. 9 inches across at the widest point and 9 inches tall.